How would you like to spend a semester in Albany; earn a stipend; and get real-world experience working for a member of the NYS Assembly? Sound attractive? It should, because not all internships offered at FSC combine the three elements of this one, the NYS Assembly Session Internship. 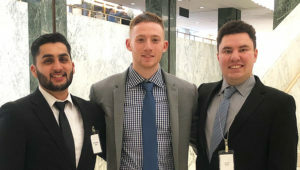 Just ask Sim Singh, Jeremy Doucette, and Daniel Nazar, FSC students who are in Albany right now. Singh is working on a dual major, Computer Programming/Information Systems and Business Management. He has been assigned to Assemblyman Clyde Vanel of the 33rd district, who is an FSC alum. Business Management is Doucette’s major; he is working with Assemblyman Kenneth Zebrowski, 96th district. 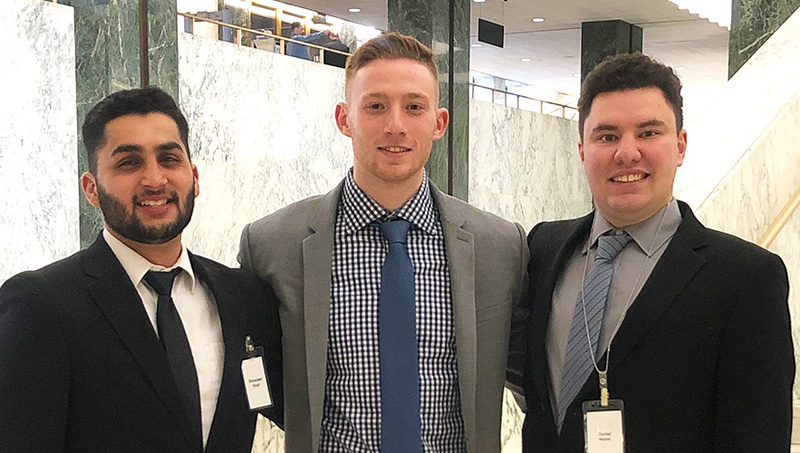 Nazar, a Science, Technology and Society major, has joined the staff of Assemblyman Steve Stern, 10th district (which includes Farmingdale and FSC). In addition to working with their Assembly member, students must complete specific FSC academic requirements, working with the campus faculty liaison. Information sessions about the NYS Assembly internship and NYS Senate internship for the Spring 2020 semester will be held at FSC in April and September. Interested students may contact the Nexus Center or send an email directly to the campus faculty liaison.